The dynamic business of advertising is quite fascinating as it encompasses an eclectic diversity of fields and activities. Spanning from matters of budgeting, discounts and commissions to creativity, the art of words and images, it communicates to consumers a viable, marketable message. 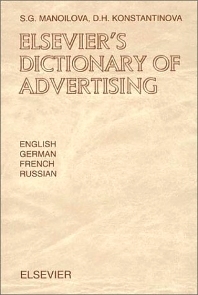 To cover such a diverse spectrum, this dictionary provides the users with terminology from the various spheres that interact to form the ever-expanding vocabulary of modern advertising: marketing and market research, creativity (graphic design, text writing and concept development, photography and film-making basics), media, prepress and typography. This dictionary will be of good use to students of advertising, advertising professionals (account executives, graphic designers, copywriters, media planners etc. ), as well as to a wide range of business people.